All About Weddings is not only focused on weddings in general, but in providing everything you could need to make your big day special. They help you find the gown of your dreams as well as special dresses for your friends and family. The store has contemporary looks as well as dresses with a vintage feel but never sells used merchandise. This store also sells inexpensive accessories and offers planning services. You can dress and plan your entire wedding in one place so you don’t need to deal with numerous vendors. Many brides have a vision for their entire wedding day; what kind of venue they want, the accent colors that would go perfectly together, and how their bridesmaids will look standing next to them. At Bella Bridesmaids, the bride can find the perfect dresses for their closest friends and family. Brides can bring in anything that will help the staff understand her vision when she brings in a few friends to choose the right bridesmaid dresses; this store has every style and color you can imagine. 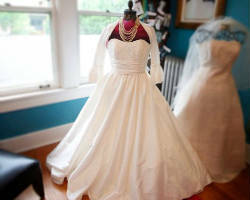 The Barefoot Bride is a wedding gown broker. This means that their selection of designer dresses are sold to brides for much less than the original price. This store only sells the dresses that are in stock when you come in for your appointment meaning you will not be ordering and waiting for your dress but rather walking out of the store with it in hand. They have dresses of every size up to 30 that are in great condition and less than three years old. David’s Bridal is the largest and most popular bridal store in Tennessee and the entire country. The popularity of this store has grown exponentially because of their inexpensive prices, and huge selection. Women not only flock to the store to find their wedding dress but to find dresses and formal wear for any occasion. This store is also unique in that they offer planning services, so you won’t have to worry about finding a dress or planning the day, you can just relax and enjoy your engagement.